Philadelphia police officers (left to right) Lt. Samantha Brown, Lt. Jennifer Foster, and Officer Kimberly Hickinson, celebrate after winning the hoagie-making competition at the opening of the new Wawa, located at 2131 South St. Hold on to your buttered rolls, Philly, because this city is getting the "most significant, unique and largest" Wawa store ever near Independence Hall this year, Wawa president and chief executive officer Chris Gheysens said Thursday. Gheysens officially announced the 11,000-square-foot store coming to Sixth and Chestnut Streets, which was first reported in November, and six other planned Wawa locations at the opening of a new store at 22nd and South Streets on Thursday. The opening coincided with Wawa Day, the annual celebration of the beloved Delaware County-based convenience-store chain that started 54 years ago, and a day when Wawa gives away more than two million free cups of coffee at its 790 stores in six states. "I love it when I see the four 24-ounces [of coffee] going out in the tray at the same time," Gheysens said. 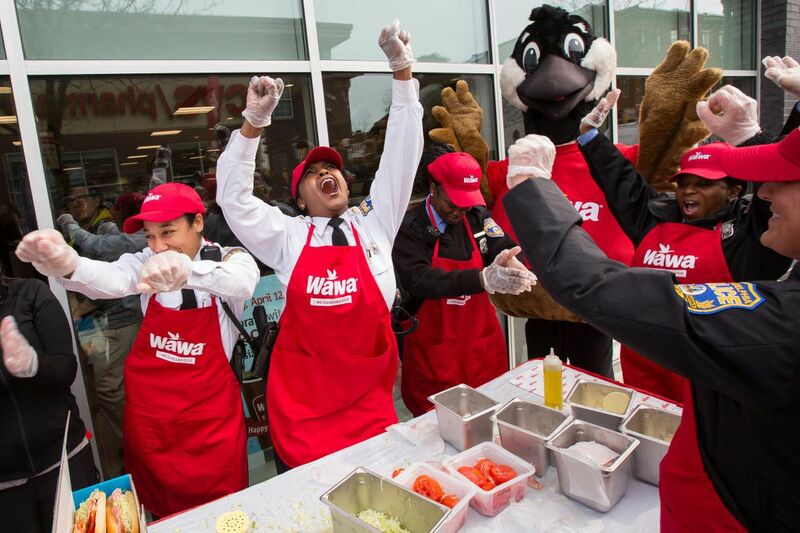 Just like Philly, Wawa knows how to throw a party. Thursday's celebration had live music, dancing, and a giant fowl running loose around the store. Here's a breakdown of the 10 most Philly things that happened at the Wawa Day celebration at 22nd and South Streets. Visitors with free cups of coffee at the opening of the new Wawa, at 2131 South St.
Wally Goose, Wawa's mascot, carried out the time-honored local tradition of holding the door open for uncomfortably long periods of time. Once a news conference began in the store, Wally stood behind the food counter with employees and photo-bombed his boss and public officials as they passed oversize checks. As mascots go, we found Wally quite charming and we've got it on good authority from a reliable source that "he is friends with the Phanatic and Kirbee the Krimpet, Tastykake's mascot." The songs Wawa pipes through its stores, which range wildly from "Where Have All the Cowboys Gone?" to "Eye of the Tiger," are such earworms that there's a Twitter account (@WawaBangers) dedicated to them. But Thursday, those Wawa Bangers were all upstaged by a live performance from the Eagles Pep Band inside the new store. The musical bar was set high when a string trio played in front of the juice-and-yogurt case at the opening of a Wawa in Washington in December, but the Eagles Pep Band, with its incredible rendition of such hits as "Runaway," was a great reminder that Philly has more character — and more fun. Speaking of the D.C. store, our feelings were a little hurt when it opened last year and was touted as the largest Wawa store ever, at 9,200 square feet. At the time, Wawa spokeswoman Lori Bruce told us that it was the "largest store — for now." A rendering of the future Wawa at Sixth and Chestnut Streets. Gheysens said the 11,000-square-foot store planned for Sixth and Chestnut, in the heart of Philly's historic — and tourist — district, will be the chain's biggest. It will include seating and a Mural Arts Philadelphia painting illustrating Wawa's love for Philly. A news release called the site Wawa's "new flagship store." Gheysens said he hopes it will be open by Thanksgiving. A rendering of the interior of the Wawa planned for Sixth and Chestnut Streets. "The instruction we are working under is we want to showcase Philadelphia's greatness because sometimes I think we forget how great this city is," he said. A rendering of the seating area for the upcoming Wawa at Sixth and Chestnut Streets. 34th and Market Streets on Drexel University's campus in University City, slated to open in the third quarter of the year. 13th and Chestnut Streets in Center City, opening in the late third or fourth quarter. 12th and Market Streets in Center City, to open in the fourth quarter. Harbison Avenue and Tulip in Frankford, slated for "later this year." Roosevelt Boulevard and Byberry Road in Byberry, also for later in the year. In mentioning the new stores and Wawa's continued success and expansion in Philly, Gheysens smiled and said: "What soda tax, right?" Mayor Kenney, who proposed the controversial soda tax and was on hand at the news conference, said not a word. He simply gave a thumbs-up. In classic Philly fashion, Gheysens and Kenney showed love to the Eagles and Villanova during their remarks, but both noted that the Flyers "did not play last night." Except they did — in a miserable 7-0 loss to the Pittsburgh Penguins. When Kenney approached the lectern, he told Gheysens: "Free coffee on your birthday is wonderful, but free ATMs all year long is even better." Kenney called Wawa "one of the best products ever conceived in retail and food" and said he often visits the Wawa at Broad and Walnut, not far from City Hall, for lunch. "People say, 'What are you doing in here?' And I say, 'I'm eating well.' "
Turns out, a lot of other people are eating well at that Wawa, too. Gheysens said the company's research showed that 40 percent of the people who walk by the Wawa at Broad and Walnut go inside. Wawa's new secret menu, which started this week, is small — the only options on it right now are a birthday cake smoothie or a birthday cake milkshake — but it's incredibly popular. It was even featured on Good Morning America on Thursday. Bruce said Wawa associates are really enjoying the secret menu, too. "We have an internal communications app called The Honker and they are sharing stories on The Honker of their excitement," she said. Watch below for a video of how to access Wawa's secret menu. When we ordered our birthday cake smoothie, the associate who made it, Cheryl Thornton, looked at it with pride and said: "That … that right there is love." Moses Cotton, 55, of South Philly, may have been the best Philly character we saw at Wawa Day. He wore a Black Panther T-shirt, a Tuskegee Airmen hat and jacket, and he carried a large wooden staff he called "the lion of Judah." "Since I am Moses I must have a staff!" he said. Cotton, a police chaplain with the 17th District, which covers the new store, said he came to support the district and get his free Wawa coffee. "Wawa is a beautiful thing," he said. The Wawa Day celebration ended with a ceremonial ribbon-cutting and with male and female officers from the 17th District pitted against each other in a hoagie-making contest. The ladies won it all, including a superb Wawa trophy and a $2,000 donation from Wawa to the 17th District's Police District Advisory Council. Over the last four years, Wawa had donated more than $50 million to various charitable organizations, including the Special Olympics and Philabundance. That includes money from the stores and the Wawa Foundation, but also from the customers who put their spare change and dollar bills in the donation bins near the registers, Gheysens said. The only disappointing news Thursday was that none of Wawa's new stores will sell beer. The chain's Chadds Ford location remains the only one in Pennsylvania with booze.